Anyway, so ya, today’s review is on this gorgeous shade of mint by Rimmel London. Now, I have avoided trying mint on my nails since I feared it wouldn’t go well with my tone but as soon as I saw this particular shade at a Rimmel counter a couple of months back, I felt intensely attracted to it and thus got it home. 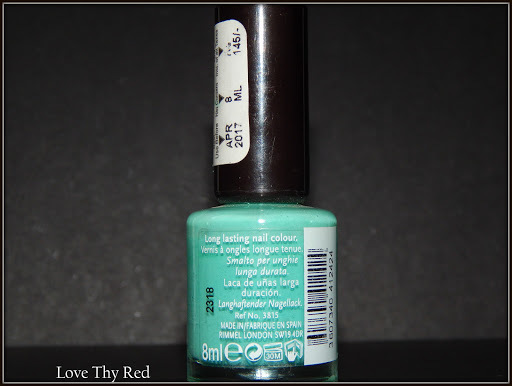 The Rimmel I love lasting finish nail color in Misty Jade is is a more than perfect shade of darkened mint and though it comes quite streaky in the first coat, the third coat creates a layer of glossy color on the nails that is hard to avoid. The nail color comes in a regular polish bottle with a brush that is broad and flat and allows to spread the color evenly and fast. The drying time is average, not too fast and nor too slow. I have generally observed that most quick drying nail colors don’t give me a look that is as glossy and rich as I like and that fast drying shades seem to chip faster. So considering that aspect, I don’t really mind if my nail color takes time to dry because I know, ultimately it would give me a better end result. The price point that this polish comes at is slightly higher than most drugstore polishes but honestly, I think the quality quite matches up to it and thus , no regrets. If you like summery pastel shades, you must give this particular shade a try. Misty Jade is sure to surprise you with it gorgeous glossy shine and incredible lasting ability, that can go upto 5 days without a chip.